A couple of weeks ago, I felt like baking, but not baking. I also had just bought a beautiful punnet of blueberries that were shouting to be used in the kitchen. Only that I knew not what to do with them. Staring at my pantry for a sign, I was rewarded with an inspiration. Not quite sure if it would work, I ran a quick search on ye old trusty Google and discovered that I wasn’t crazy and that part of the ingredients were used by others before. An idea started to form in my head. So, if you’re wondering, what items in the pantry had caused me such great inspiration? It all began when a box of Oreos, a bag of Sea Salt Kettle Chips and a punnet of blueberries met. Pulse the cookies and chips in a food processor until fine. In a separate bowl, combine both butter and chocolate and microwave for 1 to 3, 20 second intervals. Keep note to constantly stir the mixture until fully combined. The chocolate won't look like it has melted and will retain its shape until mixed. Add the mixture into the crumbed (cookies-chips) mix and combine until evenly moist. 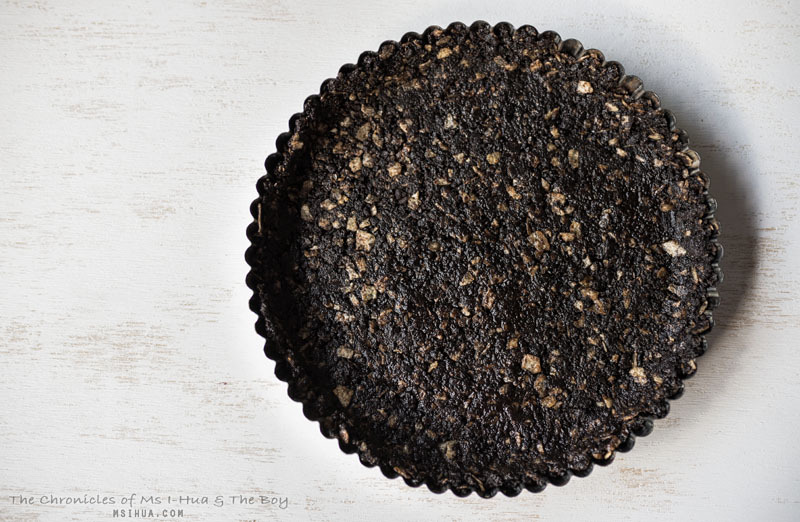 Using a clean tart pan (with removable bottom), press the tart base mixture evenly all around the tart pan. Take care to ensure that it is an even flat base. Heat cream until it comes to a boil. Very carefully, pour over the chocolate chips and stir until smooth and shiny. Add in the liquor (Frangelico/Amaretto) and mix until evenly combined. Set aside and let cool. 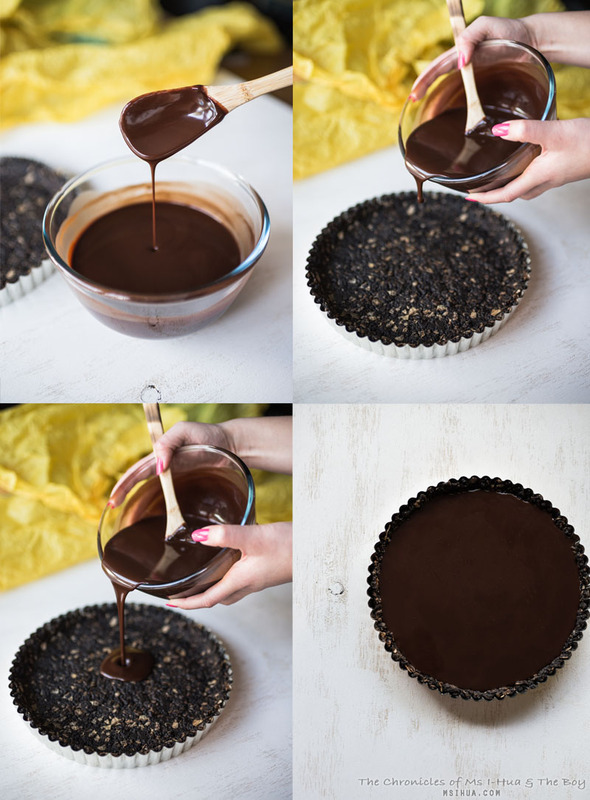 Once the tart base is set, gently pour the cooled dark chocolate ganache into the tart pan. Store in fridge for 20 minutes. After 20 minutes, remove and add in the blueberries. 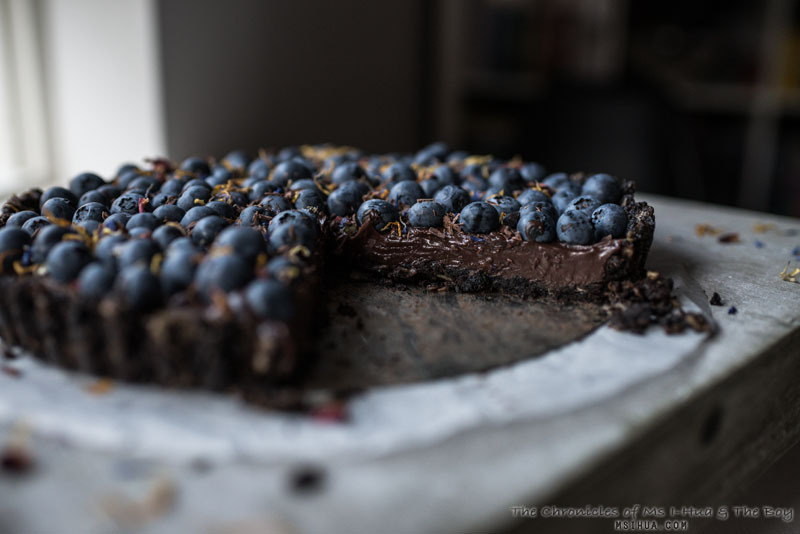 The texture of the ganache should be slightly set, allowing the blueberries to stick (but not sink) into the ganache. 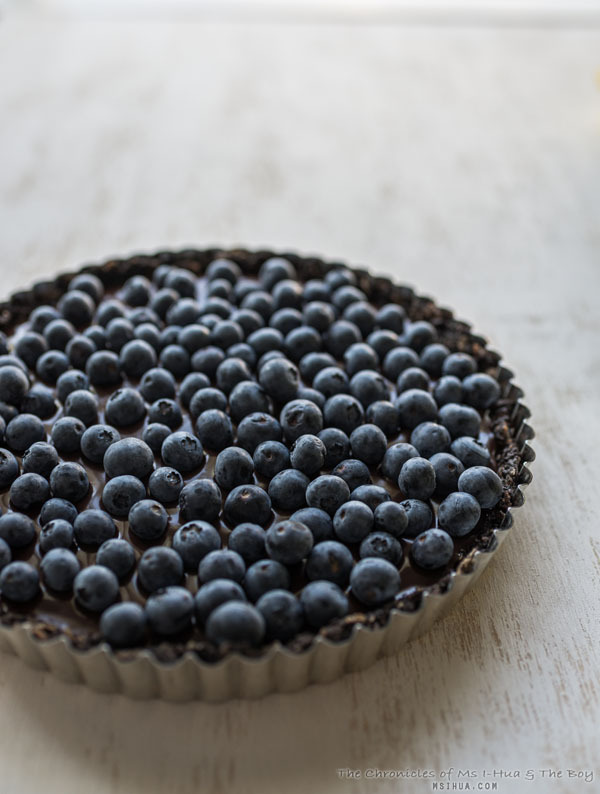 Once all the blueberries are placed as you wish, cover lightly with cling wrap and return the tart to the fridge for at least 2 hours (or until set). 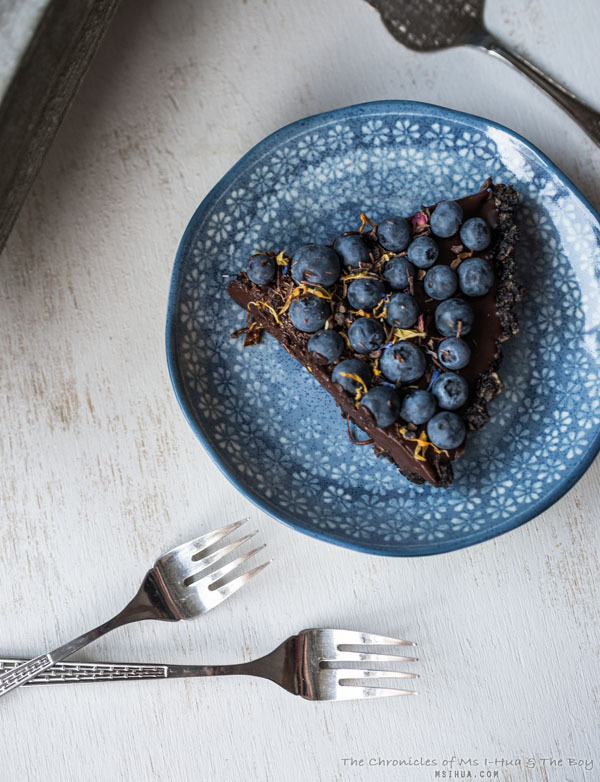 Before serving, garnish tart with dried edible flowers and/or cacao nibs for the added spring time look. Remove from tart pan and serve chilled on its own or a dollop of freshly whipped cream. The tart base caught me both in surprise and joy as the flavour combination made sense in my head, but upon tasting, I didn’t realise how good they were together. The chocolate Oreo crumbs definitely went very well with the slightly saltier, edgier and crispier sea salt chips. 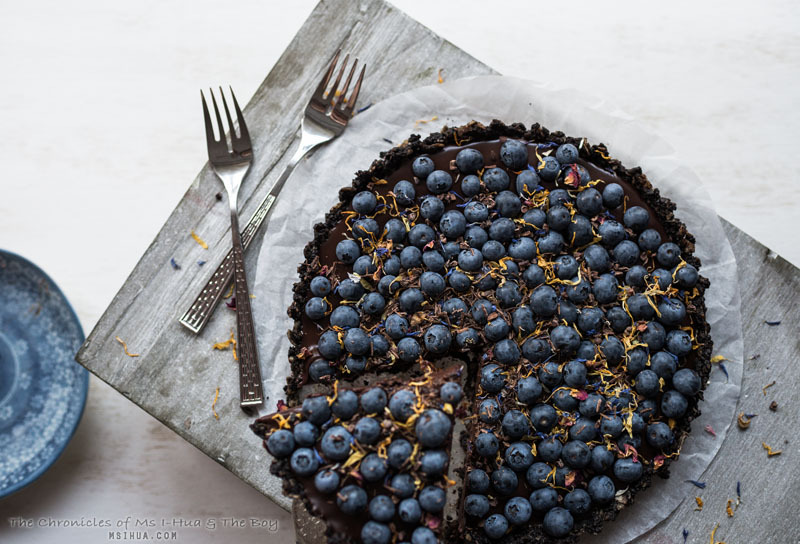 The dark chocolate ganache spiked with Frangelico also worked very well with the tart base. Smooth, rich, utterly decadent and paired with a very naughty salty, sweet and crunchy base. Did the blueberries have a part to play in all this love and taste explosion? It sure did. The little bite of acidity and pop of texture when bit into certainly brought all the flavours to life. So what do you think? Would you give it a shot? I’m already planning on the next flavour combination to go with this tart base. 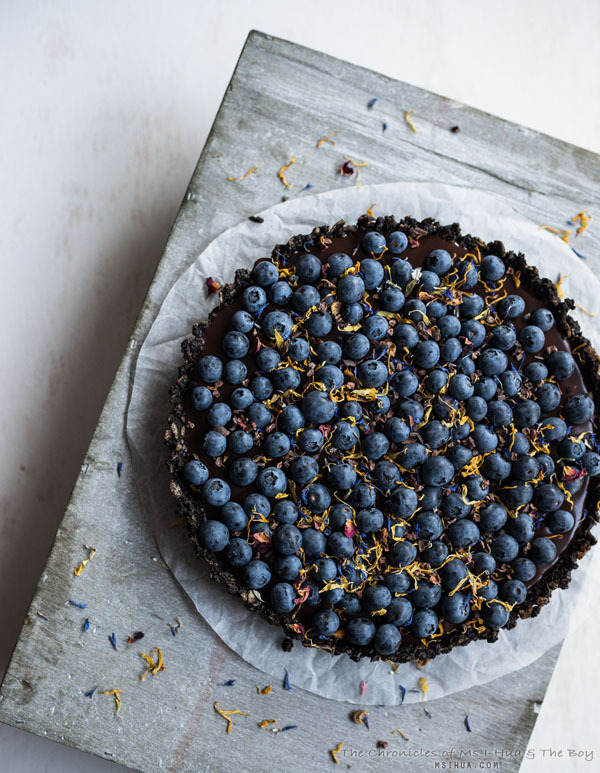 I am such a fan of blueberries so this tart looks amazing – and hey you could almost claim it’s healthy since they are a “super food”! Oh my the base.. I think the acidity from the blueberries balanced the sweetness. I’m intrigued now. Thanks for sharing. Ermahgerd this sounds amazing! Love the idea of adding chips to a tart base! Hi, read your recipe and thought it was amazing, so I wanted to give it a whirl. Just asking, for the Oreos, is it just the cookies going into the food processor or is it together with the cookies and the white cream stuff?